Free download the best YouTube to MP4 converter below! YouTube provides millions of interesting videos to free download. You may want to download some videos from YouTube and watch them on your portable devices like iPod, iPhone, iPad or PSP on the go. Unfortunately, downloaded YouTube videos are usually in FLV format, which is seldom supported by portable devices. 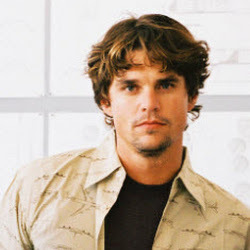 So you need to convert YouTube video to MP4 or other popular video formats so as to play the videos anywhere you like. To accomplish the task, you need to seek help from a YouTube to MP4 converter that supports the YouTube video input and MP4 output. Here Aimersoft YouTube Downloader are highly recommended to help your achieve your task. It can help you easily and quickly download YouTube videos and convert to all popular video formats, such as FLV, MP4, MOV, WMV, AVI, MPEG, DivX, XviD, 3GP, VOB, etc. Besides, the built-in video editor of Video Converter Ultimate lets you personalize your video like a pro. Convert YouTube video to MP4 at 90X faster speed. Apart from MP4, it can download video in 250+ formats, including MOV, MKV, FLV, AVI, WMV, MPG, etc. The downloaded video will maintain the original quality. Download videos in batch from 1000 other sites (Facebook, Vevo, Vimeo, Dailymotion, etc). Edit video or compress large video into smaller size. Install and launch Aimersoft YouTube downloader. Click Download tab from the top menu. Open the video you want to download from YouTube, copy its URL. Then click Paste URL button. Aimersoft YouTube downloader will detect the URL. Next you need to click on Download button. Now it is downloading the YouTube videos with full quality. You can turn on High Speed Download option to accelerate the process. 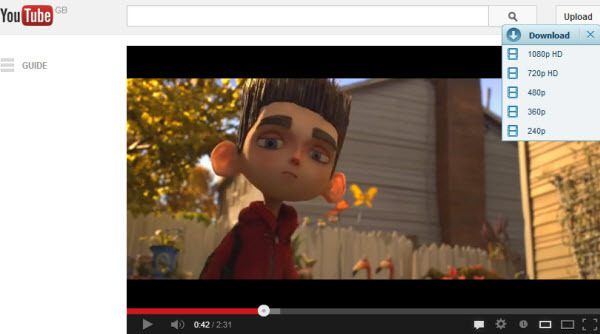 Finally, you can get the YouTube video downloaded in MP4 in the Finished tab. Here is an alternative way to download YouTube to MP4. You can do it with iTube. Step 1: This program offers you three simple ways to download online YouTube videos. But first you need to launch the browser and go to YouTube.com to locate the target video. Then you'll see the Download button on the top right corner of the video. Please click it to download the video right now. 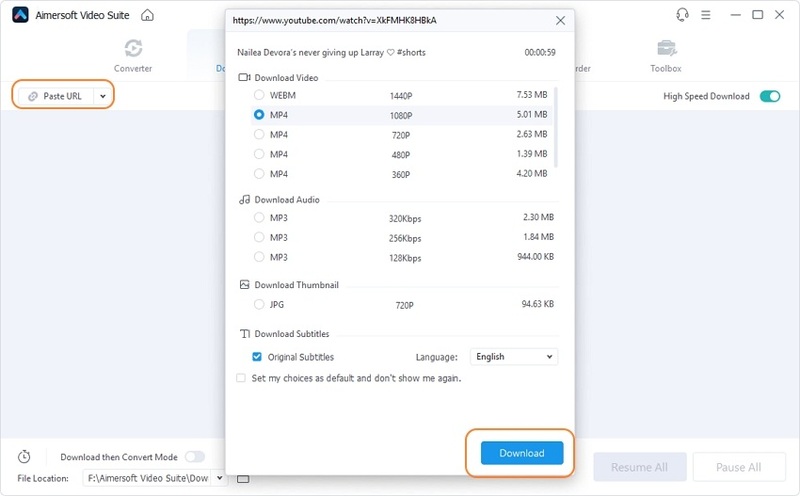 Alternatively, you can copy the video URL and then click the Paste URL button on the top left corner of the program's interface to start the downloading process. 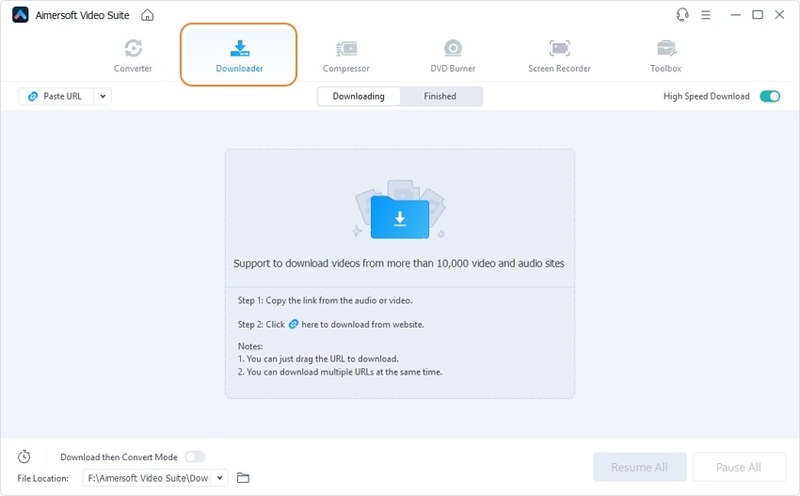 If you are using Mac version, you can also add the video to the download queue by dragging and dropping the video URL to the program. Step 2: After the video is completely downloaded, you can go to the Finished category. Here you can see the parameters about the video like length, format, size and resolution. 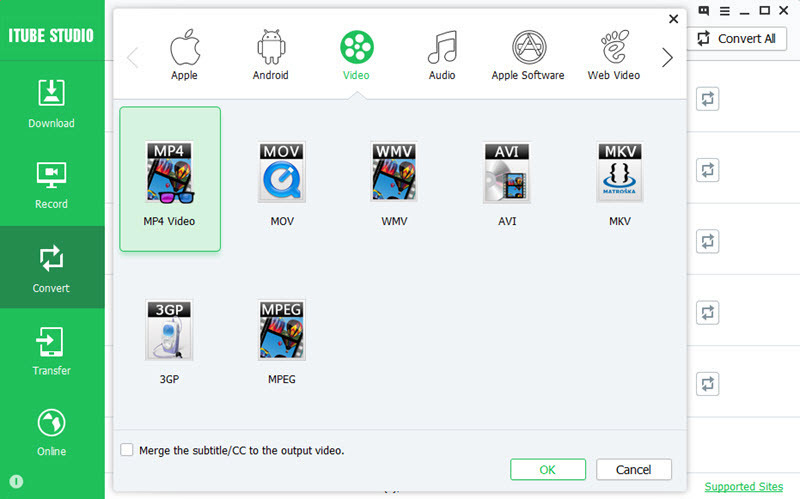 Click the Convert button beside the video you want to convert and then select Format > Video > MP4 as the output format. Step 3: Once you have set the output format, you can click OK to activate the conversion. When the process is done, please go to the Converted category and right click on the video to locate it.